1) How concrete and actionable is the input? Concrete and actionable things go into OmniFocus (unless they belong to TaskPaper, which is for very simple lists of corrections to a manuscript or things to discuss with the boss). More open-ended ideas go into OmniOutliner. OmniOutliner is for logical thinking through the project. OmniFocus is for recording the results of such thinking so that they pop-up on your lists at the right time. 2) What is the timeframe of action? Something that needs to be clarified and dealt with during the next week or two belongs in OmniFocus. Something that can sit and ‘cook’ for a few weeks or months is an OmniOutliner thing. If in June I see an article which can be used in a course taught in November I will likely drop the reference in the OmniOutliner file for that course. If I need to check the assignments within two weeks – it’s an action for OmniFocus. 3) Who owns the action? OmniFocus is only for the things I do myself whereas OmniOutliner contains all items which may be delegated or even depend on completely external actions. That’s why I often project my OmniOutliner on a screen during brainstorming and planning meetings. This software is great for structuring collective thinking. My colleagues are used to receive pdfs of OmniOutliner outlines both before and after meetings. And yet OmniOutliner is not a planning software. Recently, I am getting increasingly frustrated that, similarly to OmniFocus, it cannot display a timeline of action, which is absolutely essential for planning. Of course, one can define “Start” and “Due” dates for various activities, but how does it help to decide whether there is time for a certain project in February next year? Academics work on multiple writing and teaching ‘projects’ requiring intricate coordination of time and resources which neither OmniFocus nor OmniOutliner can support. Professional planning software (Miscrosoft Project or OmniPlan) is not only expensive, but also very complex and takes a lot of time to maintain . So I am still waiting to find a software which will help me with personal project plans. Any ideas? This entry was posted in Collaboration, Projects, Tasks, Time and tagged OmniFocus, OmniOutliner. Bookmark the permalink. For timelines as well as outlines, you should check out Curio, by zengobi software. It has all you need. Steep learning curve, but better since version 8 shipped recently. I’ve begun playing around with Curio and find it useful for the kind of planning that you’re discussing. It’s far more visually oriented than OmniOutliner but can still serve as a sort of outliner if you need it to. The other tool that might be of use is Tinderbox, which has multiple views into your information. There’s an outline view that I use for quickly getting information into the program, but there’s also a timeline view that uses the built in date attributes to display your notes on a timeline. You can create your own attributes and use them to organize notes how you like. The learning curve is a bit high, but this might do what you want. Thanks Josh and James! I tried Curio a couple of years ago – will probably try again. It was a touch too far from GTD and a bit open-ended then. I also tried Daylite (almost as expensive as OmniPlanner) but it scared me by its inability to work with iCloud contacts. I am now trying something called Pagico and I’ve seen a review that it’s good to manage writing projects. I like Eastgate’s Tinderbox for this kind of long and short-term planning. I talked about it on Mac Power Users #100 as a kind of super-charged outliner and mindmapper, but it has so much flexibility through its multiple views of your notes and its use of metadata. I tend to think of it as an environment rather than a tool. For example, for the activities you discuss in this post, you could add start / end dates to notes and view them on a timeline; or you could place notes on a visual map and group them onto “adornments” (I like to make “project” adornments and place notes on them detailing the steps needed to complete a project or just some loose notes about things the project might require). You could do both and open both views at once. Tinderbox users have also been experimenting a lot with “dashboards” recently, which provide lots of graph-like data based on metadata or number of notes in a section. For all my academic projects and long-term career planning, I always work in Tinderbox first, and maybe export concrete tasks to OmniFocus. The price is higher than other apps, but it can also do much more than most apps. In addition to outline, planning, brainstorming, etc. I’ve been using it for textual data analysis as well. It has many ways to slice and dice data and help organize textual analysis. The user forum is a very friendly place where people talk about the kinds of activities they do with tinderbox and ask questions about how others accomplish similar activities (http://www.eastgate.com/Tinderbox/forum/). There’s been some recent interesting discussion about moving DevonThink data into Tinderbox easily using AppleScript and retaining clickable links back to the original DevonThink note. Thanks Derek! I have listened to your excellent talk on MacPowerUsers 100. I really liked how you referred to Tinderbox as being non-hierarchical. Hierarchies is what always scared me away from mindmaps. So as a result of your talk I downloaded a Tinderbox trial. 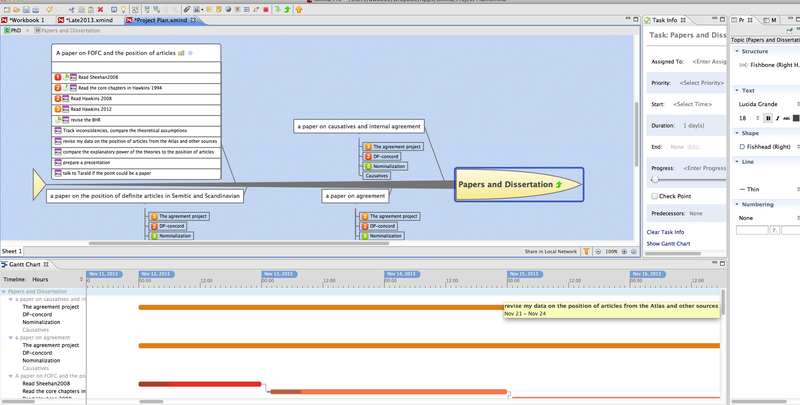 It has already helped me to complete a pretty complex thinking project, but I did not know it can do timelines. additionally, tinderbox notes can have a number of boolean metadata attributes for checkboxes and a number of metadata attributes for dates (start date, end date, reminder date, flag date, tickle date [per GTD], whatever). You can then create persistent searches for these, filter by certain conditions, or do things to the notes depending on certain conditions (turn overdue notes red, move flag notes to another part of the outline, etc.) Could be useful for thinking about tasks and projects with a bit more flexibility than OmniFocus. Of course, it takes a bit of time getting something like this set up, but runs itself easily enough after you’ve constructed it. Start dates and end dates are difficult to decide in advance (except for hard deadlines). Is there any way to simply add the estimated amount of time that something will take as a metadata attribute, and use that information in a useful way? @Derek Van Ittersum: can you write a blog explaining your experience with Tinderbox? I would specially be happy to see sb using Tinderbox to tackle complex academic notes. A few people have written about Tinderbox. But, most of the writings are either more into the fiction or really shallow ones (mostly about the Views and adornments). It would have been great if sb can show how to bring out deeply berried ideas in the forest of notes into life using Agents and attributes. Yes, Derek, it would be so great to see such a blog post! I’d gladly host it here on Macademic. Are these custom keystrokes? When I try this in Apple Mail or Outlook Mac nothing happens. Nor can I drag an email into OF. You have to go to OmniFocus preferences – Clippings and then define your custom keystroke. You should also enable an Apple Mail plugin call Clip-O-Tron at the bottom right of that preference pane. I do not use Outlook so I can’t help with this one. Hi, Dellu, that looks pretty impressive. Could you tell us a bit more? For example, how long did it take you to make the file you showed us? At the end of your article, you noted that “professional planning software (Microsoft Project or OmniPlan) is not only expensive, but also very complex and takes a lot of time to maintain.” It’s true that OmniPlan is a professional tool with a lot of depth, but it might be worth taking another look: its default view (“Simple Creation”) is actually quite easy to use, with just two columns for data entry (“Title” and “Effort”) next to a timeline where you can drag your tasks around to schedule them. And while it’s not exactly inexpensive, we do offer a 40% educational discount on our online store which means academics can use OmniPlan for $119.99 (rather than its list price of $199.99—which is, of course, far less than Microsoft Project’s list price of $589.99). We also offer a two-week free trial—so it might at least be worth taking a look! Ken, are there any pages on your website that you could point to that would be particularly relevant to us, e.g. an example of an academic using OmniPlan to plan projects? Or even screenshots of the “Simple Creation” view you mention? Fraser Speirs writes a lot about education and technology, and last year he wrote in a fair amount of detail about how he uses OmniPlan to plan out the academic year. Aleh, OF is my hub for life, and I have vacillated between OOuliner, OPlan and even Evernote in managing projects. Whatever file I use to manage a project, I link that file to a task (Single Actions) or even to a project within OF. I would like to see a OOutliner file that you have created for a project. I have found that although OOutliner is flexible, it’s almost too flexible for keeping up to date on projects. Then, I end up reverting back to keeping tabs on everything within OF. Can you attach a OOutliner file that contains a project (or at least some kind of example)? George, sorry for the delay (lots of teaching). It’s very much so for me as well. I keep project reference in places like Evernote and ‘brainstorming’ information in OmniOutliner, but firmly defined next actions go in OmniFocus. Similarly to you, I find that many of my OmniOutlines are not updated. But in most cases they do not need to. Because I used them to think the project through and after achieving certain clarity, the project just flows. But I also find that many outlines are updated very often, for example my class plans. Here is an example of a very simple outline – you can see that it is nothing more than a hierarchical checklist. Aleh, I know this is an old post, but I am wondering if you have tried inShort by Shortki for planning academic projects? It’s in the MAS: https://itunes.apple.com/us/app/inshort/id856124300?mt=12. It looks like it might be really useful for planning research projects, and it certainly is more affordable than OmniPlan. Andrew, thanks for suggestion! I will certainly try it.